Shortly after passing through Tuam the sky darkened, turning almost purple, while a low and intense sunlight made everything before me really vivid. It was spectacular but somehow conditions like this seem to only happen when I’m in the car, or looking out through the window of my house, not when I’m pointing the camera at something. I was on my way to the north coast of Mayo for the first time, specifically Downpatrick Head. When I arrived I was assaulted by wind that seemed to be seeking out gaps in my clothing. I had to clip the sleeves on my jacket shut which I’ve never done before. It wasn’t easy – the jacket must be nearly 20 years old and is pretty frayed. I hadn’t carried my full pack on my back (camera bag with all the gear, plus tripod strapped to the front) for a year and it was a shock to feel the weight of it, but it’s funny how quickly you get accustomed to it. Although I can’t get used to how far back it goes with the tripod attached and keep hitting things while passing through gates. I may as well have left the camera bag in the car as it was too windy to even attempt a photograph. The sea spray alone would have rendered it pointless. 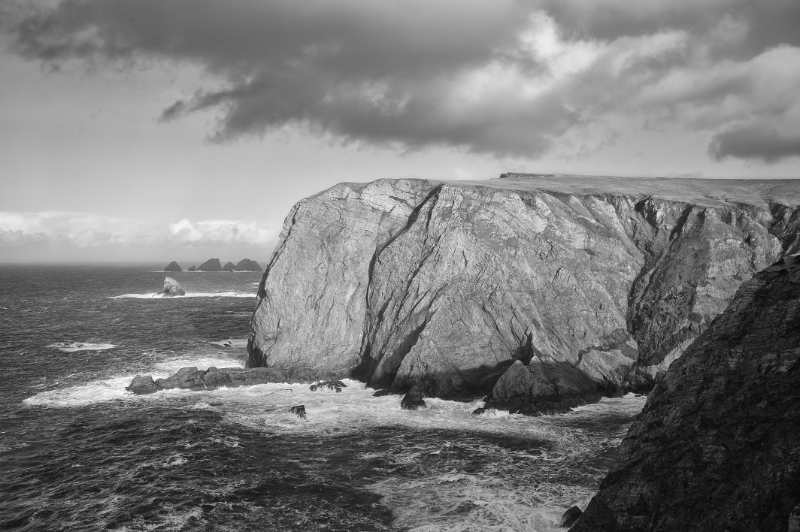 I walked along the cliff edge getting a good look at Dún Briste sea stack before heading for Doonfeeny standing stone. The standing stone is a mightily impressive 4.5 meters high and it stands on a mound in a graveyard on a silent country road. It’s one of those places that photographs don’t give you a proper impression of so I was glad I’d stopped by. On the subject of places which have to be seen to be believed, I next went looking for Polladarky. What I was looking for was a big hole in the ground near the coast, what I found (after getting directions from a farmer) was a massive sink hole with small waterfalls cascading down its side and the Irish sea being thrashed to a foam at its bottom. I tried to photograph it but it was so deep that the bottom was a totally different exposure to the top. Instead I stood as near to the edge as I dared and took it all in. After a long drive I arrived at An Bhinn Bhuí. I humped my bag onto my back and walked off along the coast. The light was coming in waves as it was so windy that the clouds were moving along at a fair clip, but the light was hitting a few interesting things at the same time and I had to tell myself to concentrate on one subject at a time. Which is not easy when you’re waiting for the light to move over to the subject that you have the camera pointed at while it’s perfectly illuminating another subject. It was windy enough where I was stood that I had to hold on to the tripod for fear that a gust would pluck it and my camera and throw it in to the Irish Sea. A few times the wind whipped up from the sea with such force that I collapsed the tripod and lay it flat on the ground, crouching down beside it, holding on to my hat. I stayed for as long as I dared and as I made my way back I was reminded of the TV footage of British Soldiers ‘yomping’ across the wind swept terrain of the Falklands in 1982*. Except I guessed my pack probably didn’t weigh as much as theirs and my clothes were probably more weather proof. I’d planned to head on towards Belmullet but I only had an hour of light left so I made my way home instead, so that I’d be able to spot anything interesting before it got too dark. * I was 2 years old, just in case you think I was watching that footage live.